Get A FREE Brochure from "Wheeler Historic Farm"
Wheeler Historic Farm is a wonderful venue for your wedding day! Our Activity Barn and Lawn Spaces are designed to allow you to be the architect of your wedding dreams. You have the freedom to choose your own caterer, decor and much more. Our rustic atmosphere and charm make the Wheeler Historic Farm Activity Barn an ideal setting for your special event. 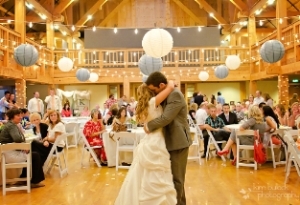 The Barn has been host site for wedding receptions and ceremonies, luncheons, dinners and more. Brides are welcome to choose any caterer. Our staff can recommend caterers familiar with the farm and our space. Wedding parties are responsible for their own set-up and clean-up. Be careful to include set-up and clean-up hours in your calculations for your reservation. You are free to decorate the barn to suit their taste. Please mention Salt Lake Bride when you contact Wheeler Historic Farm! We were able to easily set up our wedding date and everything was smooth sailing from there. As well the guests loved it! The kids loved the farm and the adults loved the look and feel of the barn for our wedding. I had my wedding there and I just loved the place!! The people that were there helped us a lot and we just so kind. I'd highly recommend this place to people! This was the perfect setting for my wedding. The barn has a beautiful rustic feel and it was exactly what I wanted. It has A/C and Heat, clean bathrooms, a kitchen, a dressing room for the bride and groom and so much more. The staff was so helpful, and clear on what was and was not allowed. There was a staff member there the entire time to help with whatever we needed. Thank for providing such a beautiful setting for such an important day! I rented the Wheeler Farm activity barn and lawn for my daughter's wedding and reception. It's really a very nice, rustic venue, and since that was what she wanted, it ended up being perfect. The activity barn is literally a barn of sorts complete with a loft, A/C, restrooms, small kitchen, tables, chairs and what they call a "bride room" all available with your venue rental. The staff were accommodating and helpful, but they do tend to nickel/dime you to death with the extra fees for most everything so make sure you read ALL of the fine print before you commit. To be fair, most or all venues of this type are the same in that respect. Clean, for the most part. Large, so it's suitable for most occasions/events/celebrations. Hopefully, I won't be booking any weddings in the near future, but Wheeler Farm is a very good option if you want that "country" feel.